The Victoria Peak Tramway is one of the busiest tourist attractions in Hong Kong and having been there twice I think it’s one that shouldn’t be missed. The tram departs from the central district through to the Victoria Peak on Hong Kong Island and finishes at the Sky Terrace 428 where you will see the iconic view of Hong Kong over all the buildings. It covers a distance of 1.4 kms and an elevation of 400 metres. The tramway first opened on 28 May 1888 and took a total of 3 years to build. The day that we had set aside to visit was stinking hot. It was the weekend and during Golden Week which is a semi annual 7-day national holiday implemented in 2000 for the mainland Chinese. The crowd was enormous, out the door and across the road and whilst it was a one hour wait the line was moving and didn’t feel that long. 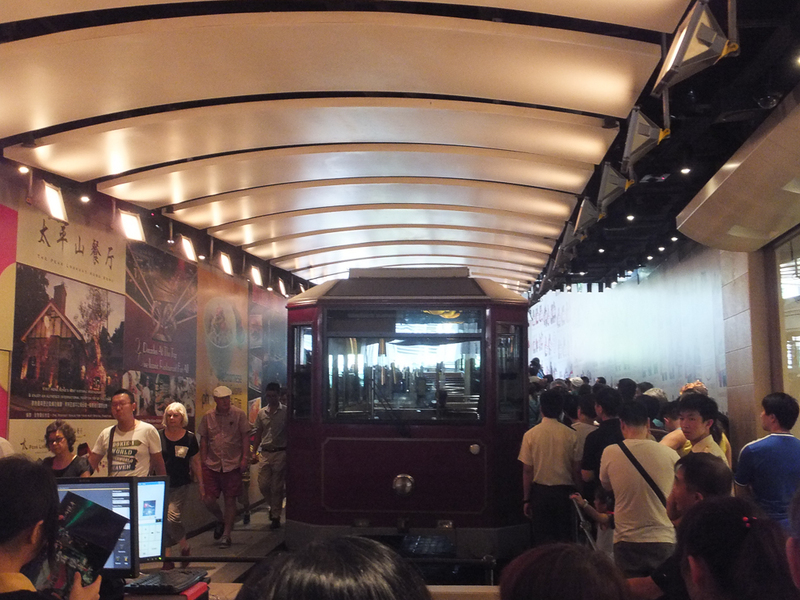 You are able to use your MTR Octopus card to ride on the Peak Tramway. It does not cost any more to use your Octopus card and is a very efficient way of doing it. I think this is the reason the line moved so quickly. The tram ride itself only takes about 5 mins and doesn’t stop along the way. We arrived at the Peak and went straight up to Bubba Gump’s in the Peak Tower, Bubba Gump’s have an awesome view and we were allocated a table in a private room with a great view from our window. 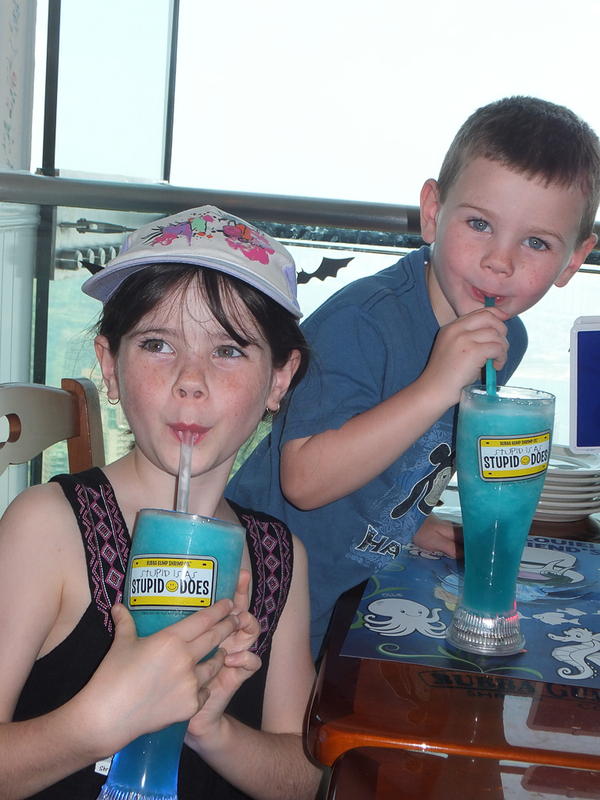 The kids were a bit hot after waiting in the heat for nearly 90 mins so we bought them a slushy to cool down. The boys had Coronarita’s which looked very impressive and tasted just as good with a rather impressive price to go with it! 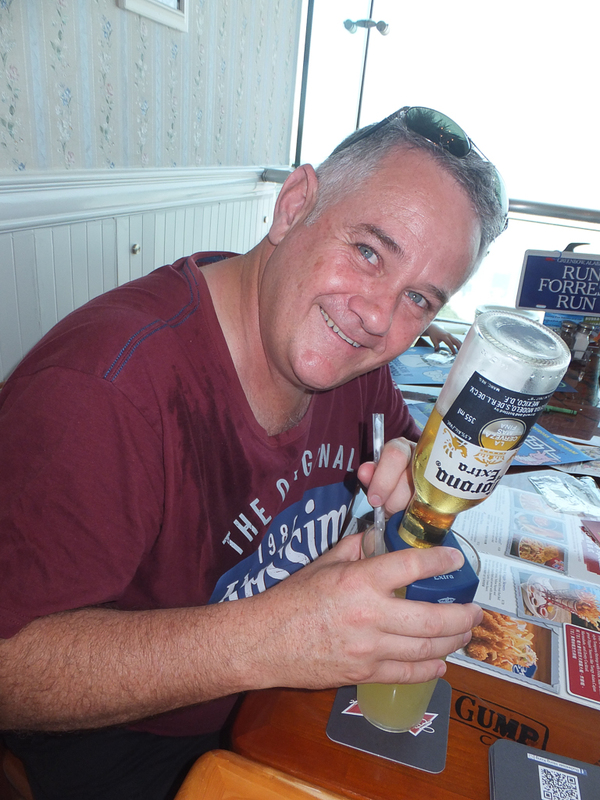 The photo below says it all, basically its a margarita with a Corona beer, with an interesting way of delivering it. We had a quick snack (can’t go to Bubba Gump’s and not partake in some shrimp, said the boys!). We then went straight up to the viewing deck (The Sky Terrace 428). You will have to swipe through with your Octopus card, you have the option to go up there or not, if you didn’t want to go up there you have not already paid at the bottom. The view is totally breathtaking. Its the second time I have been there and both times it has knocked my socks off. It was busy and difficult to get group photo without extra people in it. I was able to get good shots of the view which I was happy about. On this occasion, the view was clearer than last time I was there. I was able to see across to Kowloon and the photos are much clearer than the ones I took last year in May on my Hong Kong girls trip. 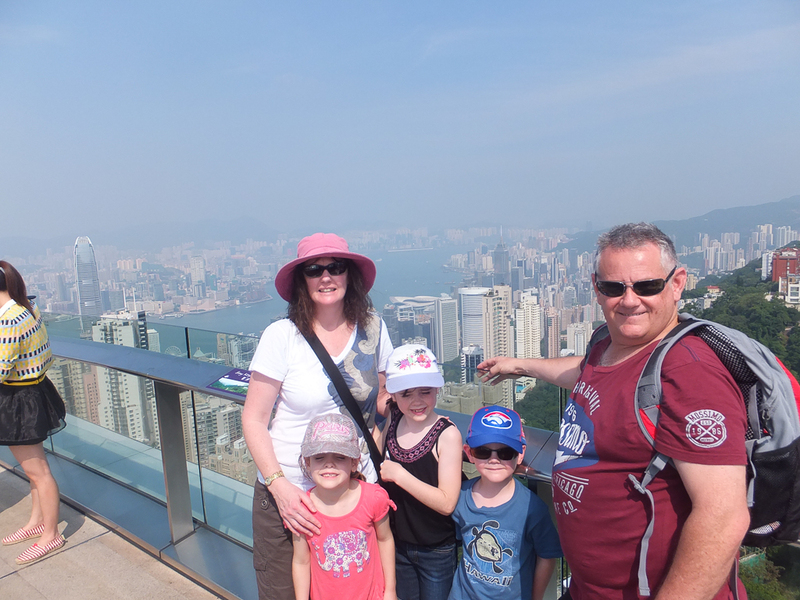 We also returned to the Peak for an evening viewing but unfortunately we had arrived just on 11pm and were unable to go right up to the observation deck where the best photos are taken. My suggestion would be that you take in this amazing view both during the day and the night. I was a bit disappointed that I missed it but the photos I got from the Peak Tower were nearly as good. Just as beautiful by night! The Peak Tower has plenty of places to eat. On the way up to the Sky Terrace there are a number of souvenir shops and other speciality shops. You could spend half a day wandering around and taking in the views. We stopped along the way at the shops and the kids got an ice cream and there were some street performers there for Halloween that the kids were happy to watch for a bit. You can’t go to Hong Kong and not do the Peak Tram, it would be going to Sydney and not seeing the Harbour Bridge! A good friend of mine isn’t really into cities, ‘concrete jungles’ don’t do anything for her, I on the other hand am a real city gal, cities blow me away. 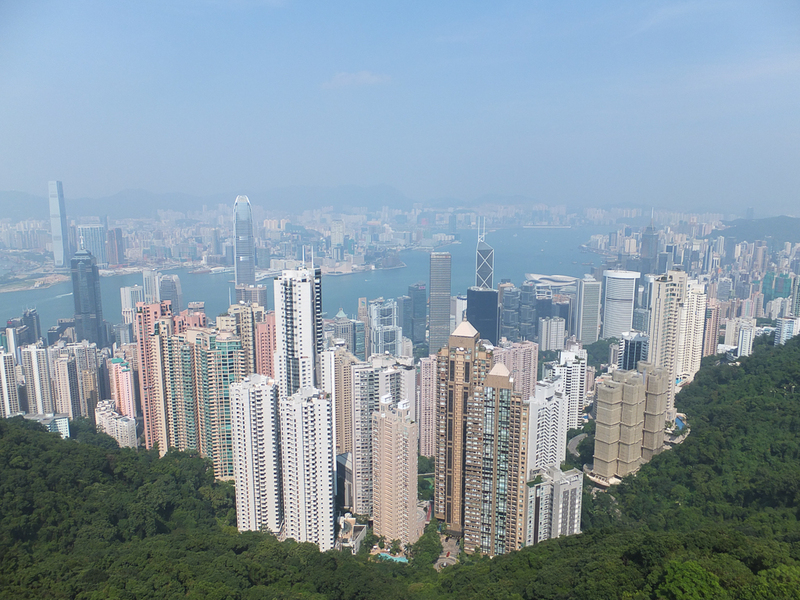 Have you been anywhere that trumps the Hong Kong Victoria Harbour view? If so, leave me a message below and I will put it on my bucket list. Would love to hear what you think of this view and if you have been there before. While in Hong Kong we stayed in an Airbnb in Granville Rd, Kowloon. We visited Hong Kong Disneyland and Ocean Park theme parks. I was thinking we would only visit one but couldn’t decide and decided to visit them both. If you only have time for one, my post on Disneyland vs Ocean Park might help you decide. Can’t get enough of this awesome view. ← So how was Air Asia? – My review. 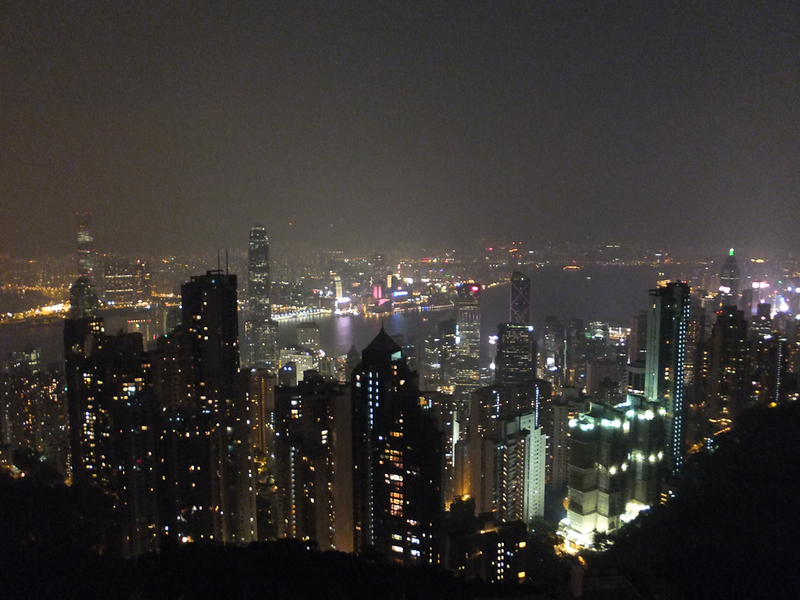 I agree that you ought not go to Hong Kong without visiting Victoria Peak, but I think the city bus is a viable option. No waiting in line! I *think* it’s #15 bus from Queens Anne’s Street. Thanks Lara, will keep that in mind for next time I visit. We were advised to get the MTR due to the political protests and strangely enough we never even saw one protester the whole time we were there. Its such an efficient city!